I'm in love with this painting by Sabrina Cabada. It is mesmerizing. I love the complementary colors- red and green. They make a powerful statement in a non-christmassy kind of way. Aside from the outfit, I'm insisting on reading a lot of classics this summer (maybe its because I'm feeling guilty for having read Fifty Shades of Grey?) and with those cute designs who wouldn't want to have those cute books adorning your bookcases when you are done? 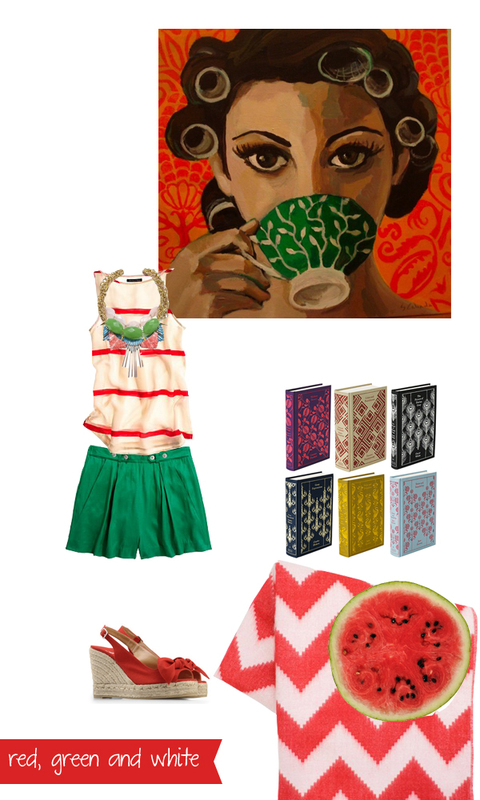 So back to the outfit- Adorable espadrilles, check, cute necklace, check, cool shorts and top, check, reading treasures, check, blanket, check, refreshing watermelon, of course! I love that striped top and necklace! I think ill skip on the shorts though- not one for pleated pants! that painting really is beautiful and the colors are spot on in this look. And after I finished 50 Shades, I couldn't walk around with that in my head for weeks being the last thing I read, so I immediately dove into some Sylvia Plath. Summer fun means watermelons and grassy knolls! Love this idea to pack a picnic and outfit in one! Genius! Omg, that outfit is perfect!! Nicely done! I love the painting too - you really selected some great stuff! I adore this painting! it is so vibrant and energetic!